The Local 518 Show is hosted by Andy Gregory; a Capital Region native, architectural design professional, and supporter of the local arts. 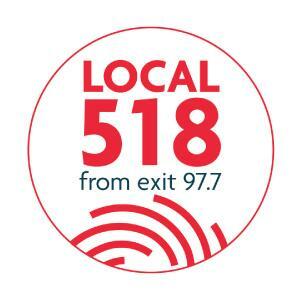 In every episode, you'll hear a variety of artists and genres from the Local 518; from Hand Habits to MaryLeigh Roohan to Conehead Buddha, and even national breakouts like Sean Rowe. Produced by WEXT-FM/Albany, NY; a service of WMHT Educational Telecommunications. Music from Northern Faces, Good Fiction, Blockhouses, promiser, Imaginary Friends, MOTORBIKE and an attic classic from The Sundowners. Music from Ayo B, Jocelyn & Chris Arndt, Drishti, Blue Ranger, Bear Grass, Hand Habits and The Sea The Sea. Plus an attic classic from Sugar Cookie. Music from Rechorduroys, Wow & Flutter, Onlyness, The Villaineers, Pillowhead, Honey Slider, Blue Factory and an attic classic from The Bougalieu. Music from Bird Streets, Luxtides, Wurliday, MIRK, The Reptiles, Dolphin Pal and an attic classic from Shu. Music from Good Fiction, Bendt, they are gutting a body of water, Turbine Sunrise, Tell Keller, and Leah Woods. Plus an attic classic from M-16. Music from The Magdalens, Elizabeth Woodbury Kasius & HEARD, Hartley's Encore, Dan'l and Hop City Hellcats. Plus an attic classic from C. Jane Run. Music from Balcony, Erin Harkes, TIP, The Parlor, Luxtides, Ryan Clark and Dave Maswick & Joel Brown. Plus an attic classic from RipRoc Bop.